Jimmy Choo Eau De Toilette reflects the inner strength and beauty. 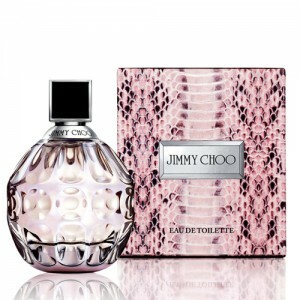 Jimmy Choo Eau De Toilette 100ml. is playful and sensual feminine perfume, whose seductive composition will awaken in you the unceasing inner glow. Fruity - floral fragrance of this perfume has a light touch of earthiness its wooden chords in the base and is intended for all strong and confident women who are eager charming and at center stage. At the head of toilet water Jimmy Choo For Women will initially pleasantly caress the lush green tones that in the wake replace the captivating power of warm ginger and juicy pear. The heart of the perfume flows irresistible desire as a sensual scent of orchids and royal red roses. This essential union leave no man indifferent. The unique smell of eau de toilette For Women Jimmy Choo then finally put the finishing touches on a hidden base of cedar wood and already mentioned. Jimmy Choo Fragrance For Women will become your favorite accessory easily and naturally, because it is the materialization of everything that is beautiful and attractive, what is a woman. With his help warm summer night like a frosty winter day. With passionate scent of eau de toilette Jimmy Choo For Women you will always feel absolutely perfect. Jimmy Choo Eau de Toilette is somewhat different from its own set of fragrance notes. The basic composition of a green pear notes and diluted to spice ginger. In the company to put a tiger orchid Taif rose, creating the effect of a special appeal. Soft-felt nice tasty trail through woody notes and cedar from Virginia. The fragrance Jimmy Choo brings positive energy and inexhaustible euphoria. Perfume dictates lifestyle - sophisticated, free, unique and luxurious. The successful and harmonious combination of notes in floral-fruity fragrance, it awakens and opens new horizons are limitless, frees the soul from the shackles of the most secret desires. No matter how many new products did not appear on the perfume market, titled Jimmy Choo always wins its quality and unique handwriting! Having become the owner of the perfume, the woman automatically gets into the world of joy, beauty, wealth and magic! As at the behest of a magic wand, Jimmy Choo provides all the cherished dreams!